Poor memory can be improved by nutrition. If notes crowd your desk and your phone is overloaded with reminders, you may want to consider making some dietary changes. While we often blame memory lapses on aging, poor memory can be improved by nutrition. "A sharp memory depends on your total number of brain cells, the smooth flow of communication between the cells and the health of cells," says Joy Bauer, author of Food Cures (Rodale, 2011) and nutrition expert on NBC’s Today Show. 1. Beets to regulate heartbeat. A healthy ticker means a healthy brain. "Every cell in the body needs a steady supply of oxygen and nutrients to stay alive and work properly," says Bauer. Keep blood pressure levels in check (less than 120/80), exercise regularly, and stock up on foods such as beets that improve blood flow, ensuring a steady supply of nutrients to the brain. "A brain filled with well-nourished neurons enables you to think and remember more clearly," says Bauer. 2. Fish to maintain brain cell health. "When it comes to food and memory, fish should be the star of the show," says Bauer. Fatty fish such as salmon, sardines, herring and mackerel contain generous amounts of omega-3 fatty acids which are important for maintaining the health of brain cells. Bauer recommends eating a four-ounce portion (slightly larger than the palm of your hand) of a fatty fish at least three times a week. 3. Berries to prevent brain cell breakdown. 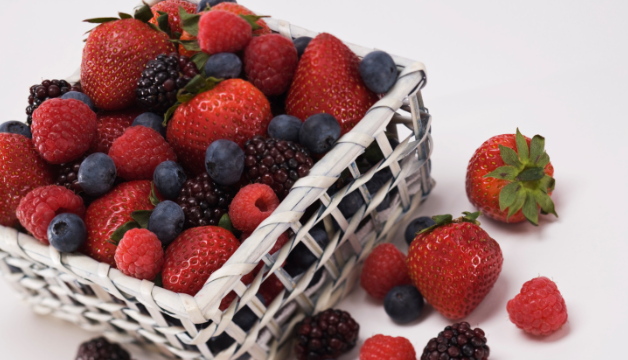 Berries are busting with antioxidants called anthocyanins which help prevent the breakdown of brain cells. A 2012 Harvard study found women who eat at least one cup of blueberries and strawberries per week experienced a 2.5 year delay in mental decline compared to women who rarely ate berries. "Blueberries in particular have received a lot of attention because they can enhance spatial memory and learning," says Bauer. She recommends eating four cups of berries per week. Even if berries aren't in season, frozen ones are just as nutritious. Add some berries to your morning smoothie or bake them into your pancakes. 4. Lean protein to improve cognitive skills. Chicken and turkey breast, eggs and low-fat milk are excellent sources of vitamin B12 which is an important protein to maintain cognitive skills. A 2012 Tufts University study showed older adults who were mildly B12 deficient were at higher risk for cognitive decline. 5. Walnuts to improve memory scores. Walnuts might resemble a miniature version of the human brain for a reason. A 2012 study published in the Journal of Alzheimer's Disease found that walnut consumption was associated with better memory scores and cognitive function. Walnuts are also a great source of alpha-linolenic acid—a plant-based form of omega-3 fatty acids. Sprinkle some walnuts on your salad or yogurt or mix chopped walnuts with pancake batter. 6. Coffee to sharpen focus. Caffeine can temporarily sharpen your focus and memory. While Bauer says a couple cups of coffee are OK to drink during the day, she recommends avoiding caffeine at least eight hours before bedtime so it doesn't interfere with your sleep. "Quality sleep is a critical component to a sharp mind," she says.